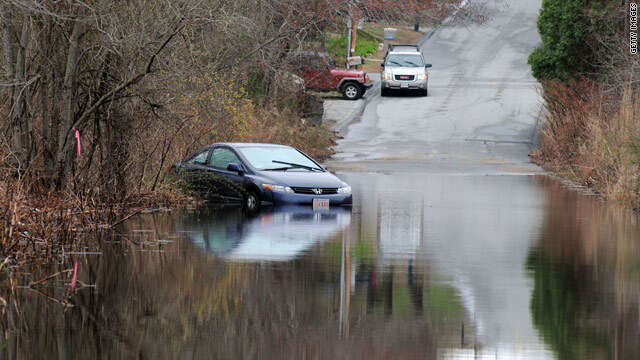 Floodwaters leave a car partially submerged Wednesday in Fall River, Massachusetts, after heavy rainfall in New England. Connecticut Gov. Jodi Rell says, "Relentless rain has created extremely dangerous situations"
(CNN) -- The rain has stilled, but the water-weary Northeast was left Wednesday to deal with flooded roads and basements as it waited for the water levels to drop. Rhode Island has been hit particularly hard. 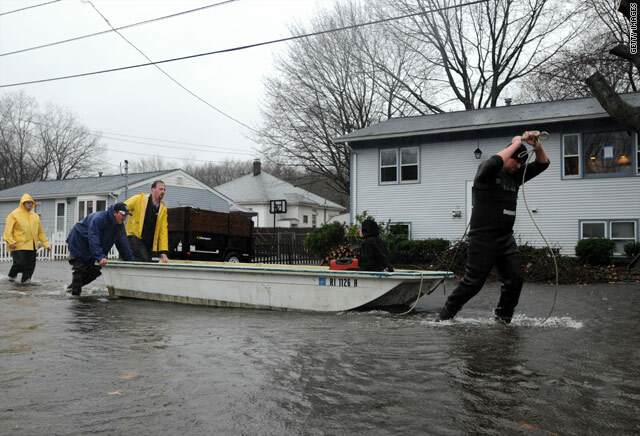 "Looking for some positives here, the water has begun to recede," said Rhode Island Gov. Donald Carcieri at an afternoon news conference. He said the state has had some bad accidents but no fatalities. It's "really very positive and encouraging given the amount of water and the circumstances that so many of our citizens have faced," he said. A rainstorm formed earlier this week and soaked the Northeast on Tuesday, exacerbating the remaining effects of another major storm from two weeks ago. Although Tuesday was a rough and rainy day for most in the region, Rhode Island appeared to fare the worst. "We're just all ready to throw the keys on the counter and walk out of the houses," one Cranston, Rhode Island, resident said. "It's at that point now, you know?" The storm dumped 8.75 inches of rain in East Providence, 7.6 inches in downtown Providence and 5 inches in Cranston, all in Rhode Island, said Tom Econopouly, a senior hydrologist at the Northeast River Forecast Center in Taunton, Massachusetts. "I can turn on the jet skis and go for a ride," one Rhode Island woman said. "What can you do? Mother Nature's winning." All eyes were on the Pawtuxet River, which runs through Cranston. The river crested at 20.79 feet Wednesday, nearly 12 feet above flood stage, according to the National Oceanic and Atmospheric Administration's Advanced Hydrometeorological Service. The water level began a slow decline during the day but remained above 20 feet at 5 p.m. Wednesday. "We have some historic flooding going on in places we've never had flooding before. We have numerous streets that are closed, and they're telling us the worst is still yet to come," said Cranston Police Lt. Stephen Antonucci. Cranston Mayor Allan Fung said the city was facing dire circumstances, even though the weather was now cooperating. "One of my sewer pump stations just failed, so it's some bad news for many of the residents," he told ABC's "Good Morning America." He said the city was asking people to conserve water. About 130 homes have been evacuated, many voluntarily, he said. Schools were closed, as were some roads. "It's some very dangerous conditions," he told ABC. The state shut down parts of Interstate 95 in both directions, and Carcieri said Wednesday that it was expected to remain closed Thursday morning. Commuters will have to take alternate routes, he said. "That means it's going to be slow. It's going to be slow-going, nothing we can do about that," he said. Amtrak said Wednesday that it suspended the Acela Express Service from New Haven, Connecticut; to Boston, Massachusetts, because of "high water conditions along the tracks." It said service east of Providence will continue to operate but that "passengers should expect delays through the area." Earlier in the week, President Obama extended a state of emergency for Rhode Island, freeing up federal dollars to help with relief efforts. A spokesman for National Grid Energy Services said 12,000 to 14,000 customers were without electricity in the Cranston area, where a substation was underwater. In Westerly, another 9,600 customers were in the dark, the spokesman said. He told area residents to expect rotating outages throughout the night and predicted they would continue for days. The National Grid asked customers with service to conserve power. "Historic rain falls and flood conditions are causing power outages throughout the region. Customers in some areas may be without power for several days," it said. In Connecticut, Gov. Jodi Rell said a state of emergency put in place for the storm earlier this month remains in effect. "The relentless rain has created extremely dangerous situations, especially in eastern Connecticut," she said Tuesday. She announced that she has directed the Department of Public Safety to reassign all available state troopers to eastern Connecticut to assist with road closures and other emergencies. In Yantic, Connecticut, the Yantic River set a record when it crested Tuesday at 13.6 feet -- 4.6 feet above flood stage. Yet another record was predicted for Saxonville, Massachusetts, where the Sudbury River was expected to reach 13.4 feet Wednesday afternoon. The flood stage is 10 feet. In Massachusetts, four to seven inches of rain fell in the eastern part of the state during this latest storm, said Scott MacLeod, a public information officer with the Massachusetts Emergency Management Agency in Framingham. Most of the flooding in Massachusetts occurred in the Bay State's southeastern corner county of Bristol, where about 200 people were evacuated, he said. Gov. Deval Patrick has declared a state of emergency and activated the National Guard, which was prepared to assist overnight. A handful of shelters were open, though few people were staying there. No reports of power outages in the state were made, MacLeod said. "It's mainly flooding issues -- closed roads, flooded roadways and basements." CNN's Reynolds Wolf contributed to this report.